It's still in alpha stage, many things are incomplete and even buggy at times. But it's complete enough to give an idea and maybe even can entertain you for a few hours. To avoid misunderstandings: This is not a 3D space flight game. I have left that out intentionally - I want to focus on the other parts of the game. I don't think I have the skills and resources to make a 3D view, and I beleive that my time is better spend on the parts, which provide functions for the game and the world. The latest additions were metal mining on planets. With that in place I think I have all of the basics covered now, except the ship yard and selling information about newly explored planets. 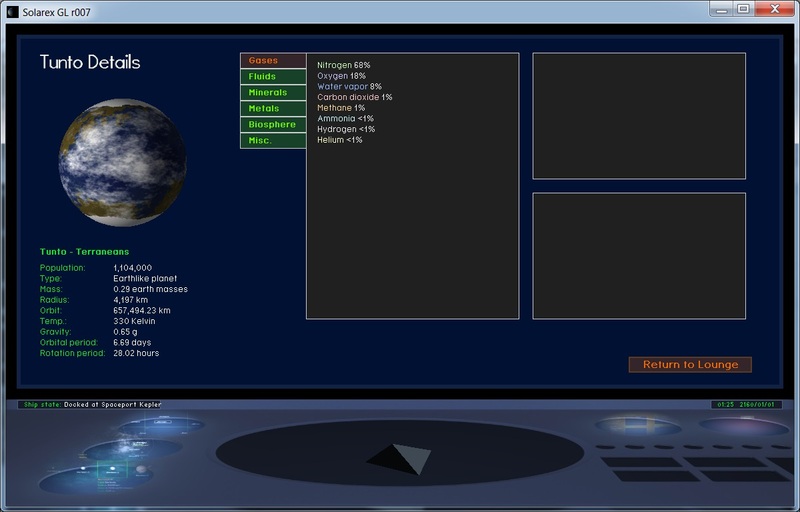 I've given the project a slight visual overhaul - it got new buttons and a display background for rthe main panels. Also a few bug fies for the ship state display. I've been working on a variety of areas, improving some graphics, expanding the goods and trade system, as well as to add and regroup goods which will be collectable through prospecting and mining. Still everything is very incomplete, but good enough to take a look. - Grouped many former gas goods into "Common atmospheric gases"
Now I want to build some sort of social events for the races. One thing I want to have is a sports league (or rather several), the other idea was about music, or whatever a race might have as equivalent. And last but not east, all sorts of social events, tailored to the races traits. I hope if I have some of such together, I can implement a background simulation which will create events from these ideas and make the Solarex' world appear more alive. Thanks for any input! I think adding culture would be great! It could get a little confusing, considering if each species could have many cultures, as humans do now. Also, events such as global extinction should be possible, more common on the less-hardy races, such as humans and poison-breathers, and less on the Rockeaters and clonknicks. It would be cool (but difficult) to see inter-species sporting events. Also, radioactive elements with long half-lives (on the scale of billions of years) should be transportable and used in lower-to-mid tech as a power source. I like what I'm seeing and can't wait to actually try the game, so well done so far! Also, for music, it would be cool if their styles were very different from ours. The clonkniks would have very mechanical, ordered music, the ones that float could have very slow-moving, ambient music that is confusing without much order, and the Rockeaters would have very percussionistic music, while poison-eater's music makes humans feel... Uncomfortable. Clonknik coordinated noise performance "The crescendo of a thousand tools" biggest succes of 2164. Poison breather gas and smoke art combo performing "Ring, Bubble, Ring!" at 20:00 GST. Gas masks are availbale for rent at the theater. Rockeater equilibration artists on tour with their new program "Rock on Rock", shaping never-berfore seen rock formations just with their bodies! New clonknik show coming "Arcing Highlights", light and energy art at their finest. A power loaden experience! Traditional terranean mixed folk art combo perfoming a yet unheard work for taiko, balaleika and choir. The masters of ambient sound on tour with "Noises of the hidden winds". A unique chance to experience floatee harmonysound art live! ... nothing of that is in the game yet though, I was just brainstorming newslines. I've been working on a "newspaper" sort of display. The newspaper layout is fixed, the content can be generated. It's a try to let the player know about background events, which happen without the player being involved or even physically present. I'm not sure if a newspaper is the right style to present such news in a sci-fi game, but I couldn't think of something better - and the idea of a space prospector sitting in his cabin, pipe smoking and reading about the latest news in a real paper actually looks "right" to me The example isn't prospecting news though, rather the daily gossip. The sports leage and sports news are created by a simulation, and some text processing. I think I an do similar for celebrity news, music/arts andsuch sorts of social events. Also, news from trading and prospecting can be generated this way, but I have not implemented that yet. The right column is a fixed tex. I have no idea how to create such sort of text automatically. Any help will be highly appreciated. It doesn't have to be "real" news, just entertaining to read and appear like real news - "believable" is good goal, I think. Edit: Added random equipment and travel ads, exchanged the screenshot with the version which has ads included. (Mining only works for metals so far, although other gathering drones are for sale as well). The neutorn stars and black holes serve no special purpose yet, they are just there to round off the selection of stars. Brown dwarves are still to be included, but I think those are the last special stars missing. Edit: The newspaper code is included, but unlike the example above it's not linked to any sensible data in the game yet. A quick overview of the new stars and planets. All but the brown dwarf are included in the v0.38 In the next release brown dwarves will be included too, and neutron stars and black holes can become members of binary systems, occasionally even have a planet. Neutron star masses might be off in v0.38 (should be between roughly 1.5 and 10 sun masses). Your stars (light sources) are shaded by an external light source...? Looks like just the brown dwarf, which is basically a star that doesn't produce visible light. These are, it seemed to look better this way. The real suns are self-lit. Brown dwarfs are in now, and there has been some more changes. - First "complete" newspaper code - buy the Secret Eye! I feel a bit uncertain about this release because I've changed a lot of small details in the stellar system generation routines and it might be that "buggy" systems are generated now and then. I checked a number of systems which looked sane, so I hope it will be alright. I've added a fast interplanetary drive, called "stardrive". With this you can quickly move inside a stellar system, and it should make travelling much easier. It's been only a minor addition in terms of code so I labeled this relase "0.39a" Still the new drive seemed to be worth a new release. You can activate both the stardrive and the interstellar jump drive from the "Navigation" panel. At the moment the drives work instantly and from everywhere, but later both drives will require you to navigate away from any massive space bodies. They are supposed to work in low gravity environments only. To activate the jump drive you must first select a nearby system from the galactical map, to instruct the drive where to bring you to. 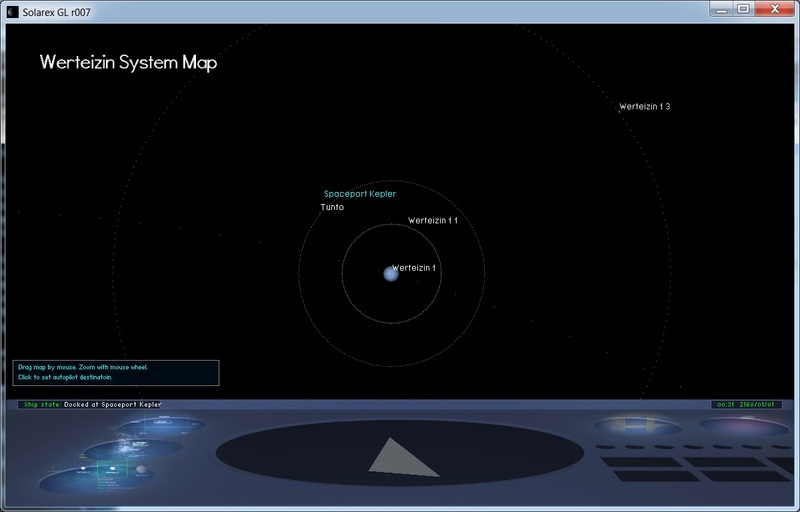 The stardrive needs a destination set in the navigation panel, you can do this by clicking into the map. Most changes and bug fixes were done for the travelling code this time. Travel isn't a core feature, but of course required to reach the other systems, so at this point of the project it seemed important to give it some more care. If no serious mistakes slipped my attention you can now mine for metals, distill fluids and collect gases with the available resource collection drones. So the mining part seems to be usable now, although the prices for the drones and the goods need some balancing. At the moment you can buy drones even if your account does not hold enough cash - so you can try the feature right away. Mining on inhabited or owned planets is no longer allowed though. Another important feature completed: Transport quests (parcels and persons) are working now. There might have slipped some bugs, but I could successfully finish two delivery quests in my tests and it seems they are also saved and loaded correctly. I think from now on development work will turn more towards expanding the existing features, bug fixing and balancing. Recently I've picked up work again and tried to add an OpenGL based first person view space flight mode. Currently I'm reworking the UI panels to use OpenGL as rendering system. While not exactly hard work, it's still time consuming and will take a while till it's complete - given that even the old Solarex was nowhere near a "complete" game. Currently most missing are the bulletin board, the navigation map and the shipyard - also access to loading and saving the game, that will be part of the nxt release, though. I'm a late adopter, but when I heard that driver vendors want to stop supporting legacy OpenGL, particularly on Linux, I felt it's getting time to bit the apple and learn how to use the programmable pipeline and the OpenGl 3.2 core. So much of the past week went into learning and testing, and finally converting parts of Solarex GL to use OpenGL 3.2, removing calls to legacy functions. There is still some functionality using legacy Gl, but the space display and related stuff is now done via shaders as VBOs. I assume this will help performance, too, but that wasn't a problem before either. Besides that I've converted one more UI panel to OpenGl based display routines, so only the ship yard and equipment shops are left to do. 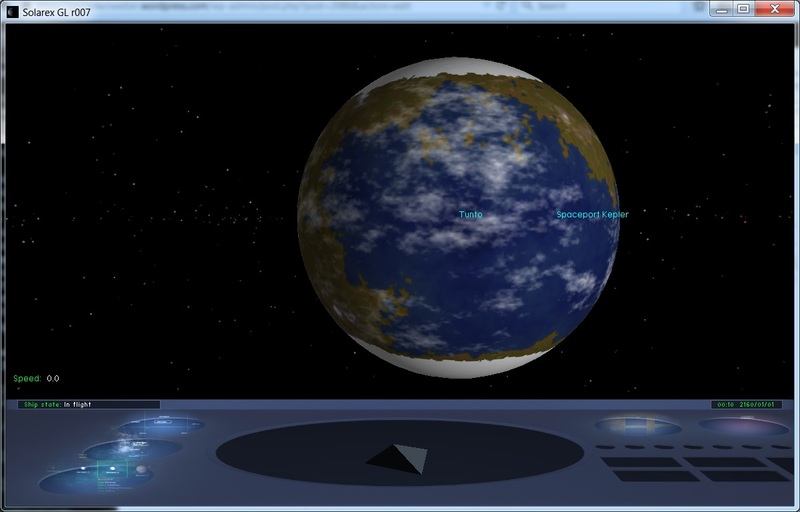 I'm also updating the planet generator, but I'm a bit stuck in a performance bottleneck there. The planets are generated during the hyperjump towards the new system, and 5 or 6 seconds don't seem much as a number, but watching the hyperjump animation for 5 seconds always makes me wonder if the game has frozen, or if something will happen. Improving the planet generation, that is, adding more realism to the planet surfaces will make it slower and the problem worse. A better hyperjump animation could help to keep the players entertained. Or I need very patient players. Planet generation is done in parallel, so all CPU cores are used, besides improving the algorithm itself, I can't do much to speed up the planet generation. 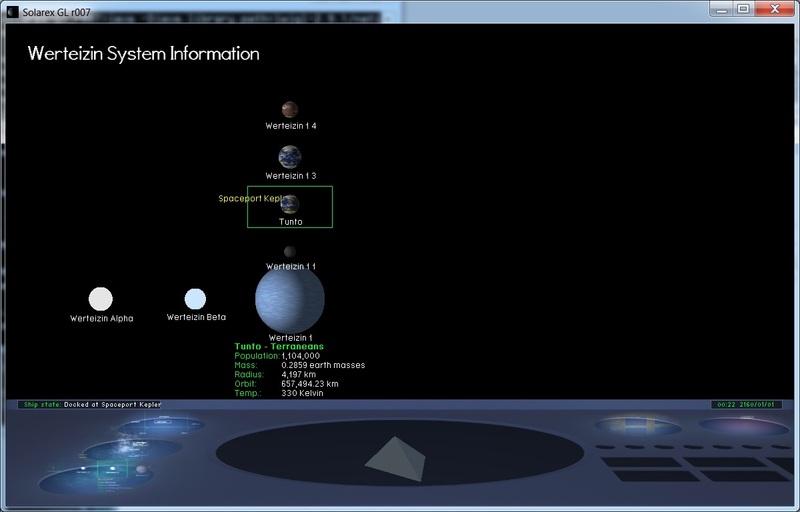 - Space display uses programmable OpenGL pipeline (OpenGL 3.2) now. That should help performance but might have introduced new bugs (I'm almost certain that there are some which I haven't tracked down yet). Overall I think Solarex GL slowly reaches a playable state. Unless some crippling bugs show up which I'm not aware of at the moment. Trading goods should work fully, the quest/job system is missing an UI to see the job list and accept them, and resource harvesting is still in need of a complete new design. I think I'll do the quest panel next. I feel ashamed. OpenGL played tricks on me, and the "front" vector of the display and the "front" vector of the ship got out of sync once you left the x-z plane, i.e. flew up or down. I don't feel ashamed for the hideous ways of OpenGL so that the "front" vector of the view transform somehow isn't dir4ected to the middle of the screen and one needs the inverse transform (what sort of logic is behind that? ), but that I didn't notice the problem throughout 5 release. Sigh. And when I noticed, it took way too many hours to come up with a solution. I've published r006 now, with fixes for the "forward" problem. The ship should now always fly there where the center of the window is. Tilting and rotating looks a bit odd, but I think it is correct - the ship rotates around the ships "up" vector, and tilts around the "right" vector, which often ends at an odd position in regard to the systems ecliptic, but as far as I can tell, it's calculated correctly. Also, the new system map and a fixed equipment shop panel are included. You can buy and sell resource harvesting drones in this version, but there is no UI yet to activate or deploy them. And no graphics. Also, your ship will still fly by magic if you sell the drive. And the drive doesn't need any fuel, even if you keep it ... lot's of small things left to do. The humbled peoples demand screenies! So, let's take a tour. 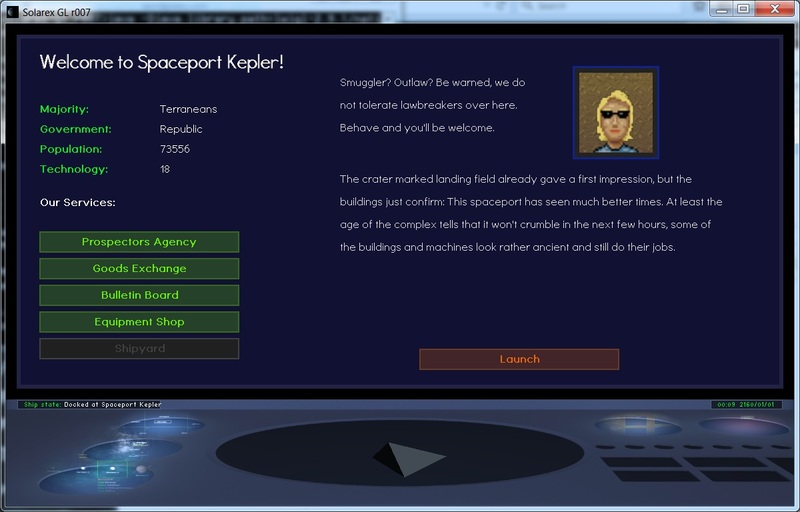 Currently you start your career as aspiring prospector, trader, fed ex driver and eventually also bounty hunter in the Werteizin System, on spaceport Kepler. The goods exchange allows to buy and sell the usual commodities, at least those which the government has allowed. The bulletin board allows you to take fed-ex quests, and occasionally find an offer or request for illegal goods. In the equipment shop you can get passenger cabins, new ship drives, fuel tanks, resource gathering drones and the like. The prospectors office is not functional yet. There you will be able to sell information about freshly explored planets to companies, claim the planets as yours and sign mining contracts. Of course unexplored planets aren't found anywhere near the inhabited zone, so you need a good ship and stock up on resources before you go exploring. It's a dual star system, made of two white dwarfs, and a single gas giant and it's moons, which survived the supposed nova when the white dwarfs were born (Edit: Werteizin Beta is actually a neutron star, sorry for that). Funnily enough two of the moons are quite earthlike, in size and conditions, so the terraneans colonized one of them. The blue circle is your current hyper jump range. The more freight and equipment you have boarded, the smaller it will be. Drives work against the ships mass. 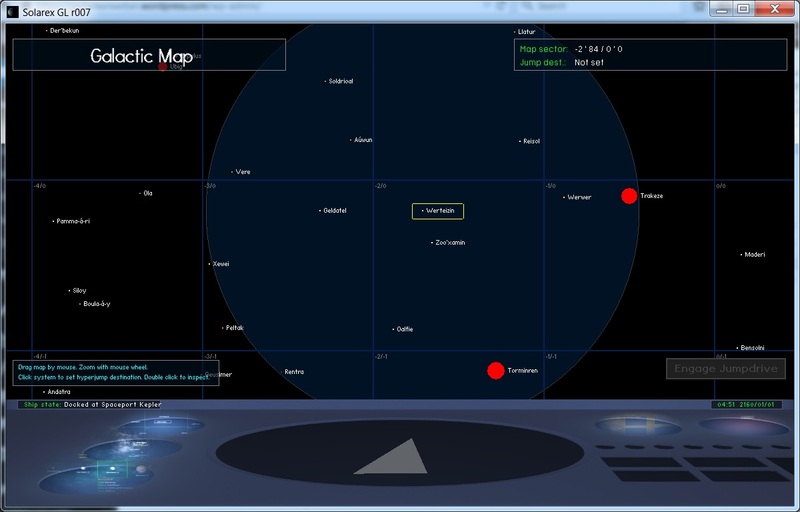 You can also set destinations for the auto pilot on this map. Atmosphere, minerals, metals, lifeforms etc. are just the info that you will be able to sell through the prospectors office. But you'll need the right sensors and probes to explore a planet this thoroughly. Next step is to fire up the jump drive and brings goods, parcels and passengers to a system nearby, to make at least a little money for living, until you can afford a better ship (... and until I have finished the shipyard panel). Beware, Solarex old code base still had bugs, and the OpenGL 3D space flight extension I'm currently adding surely has it's own bugs. I've labeled the project "alpha" stage, so you can start it and take a look, try functions, but most things are neither complete nor particularly error free. I've successfully transported goods to another system, so that much works. I believe though, that the fed-ex quests are broken in the current release, but I haven't actually tested it.